Most businesses fail because they make these 5 critical but avoidable mistakes. If you are in business you are likely making at least one of these mistakes right now or a bunch of others that can send you careening into a legal landmine. Are you protecting your business to the fullest extent possible? Do you worry that one legal misstep will send your business tumbling into freefall? Overwhelmed by seemingly contradictory requirements? Don’t worry. You are not alone. The “must have” agreements to protect your business. How to arm yourself against the everyday threats that can destroy your business. How to get past the legal mumbo-jumbo and know what really matters. After more than 20 years as a business lawyer and litigator, Nancy Greene was tired of seeing the heartbreak of business owners who’d lost everything from mistakes that could’ve been avoided. Through her professional experience, Nancy has seen very limited legal resources for small to mid-sized businesses. It became her mission to demystify the legal field and help businesses leverage the law. 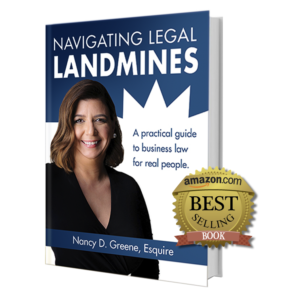 Nancy developed a series of YouTube Videos, blog posts, and launched a book in September of 2016 – all with the goal of helping business owners avoid the Legal Landmines that can destroy their businesses. 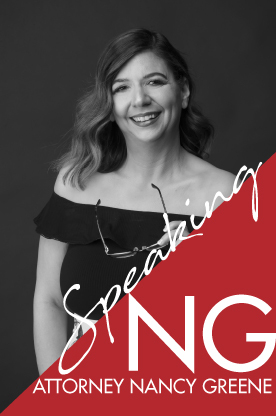 An Amazon best-selling author, member of the National Association of Professional Women, NAPW Woman of the Year 2012/2013, and eWomen Network platinum member. When Nancy is not practicing law, she spends her time on her horse farm with her husband and two teenage boys and writes fiction.